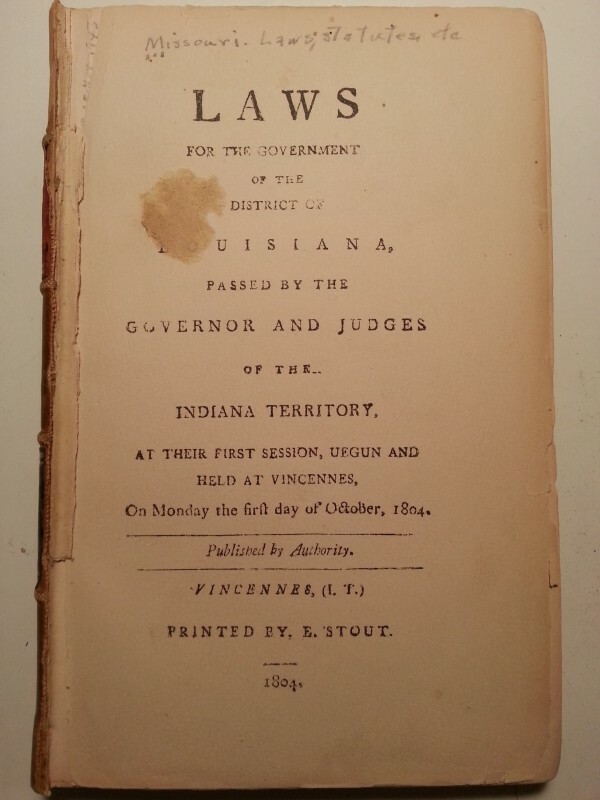 Which led me to do a bit of digging, since I hadn’t been aware that the Indiana Territory had once been the governmental body for the Louisiana Purchase territory. And, in fairness, it wasn’t for very long — the District of Louisiana existed for just about 9 months. On July 4, 1805 things were turned over to the new governmental body of the Louisiana Territory. 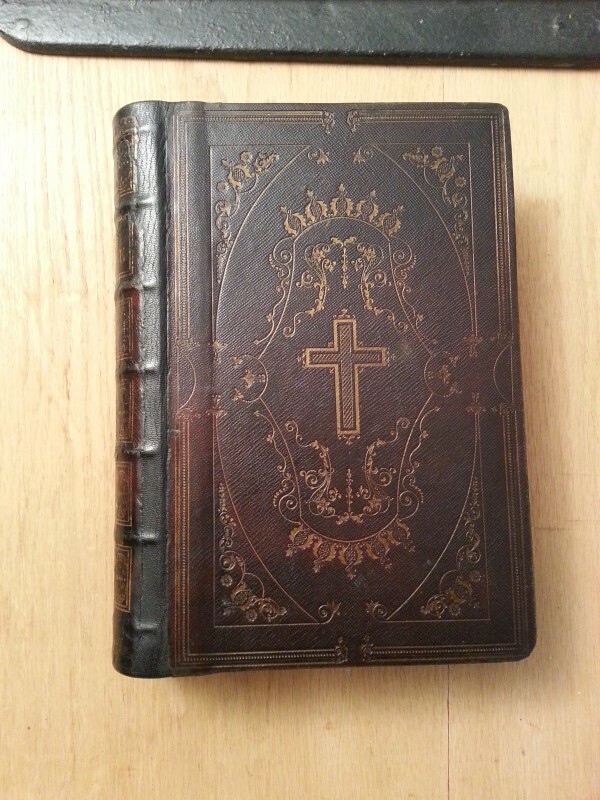 So it’s only 110 years old (which I could tell from the binding), not 210 years old. Still a pretty rare item, though — note that there were only 50 copies printed, and I’m sure at least a few have been lost to time. Meaning that it is more rare than the Gutenberg Bible (of which only about 48 copies remain). Interesting, though obscure, bit of history I thought I would share. 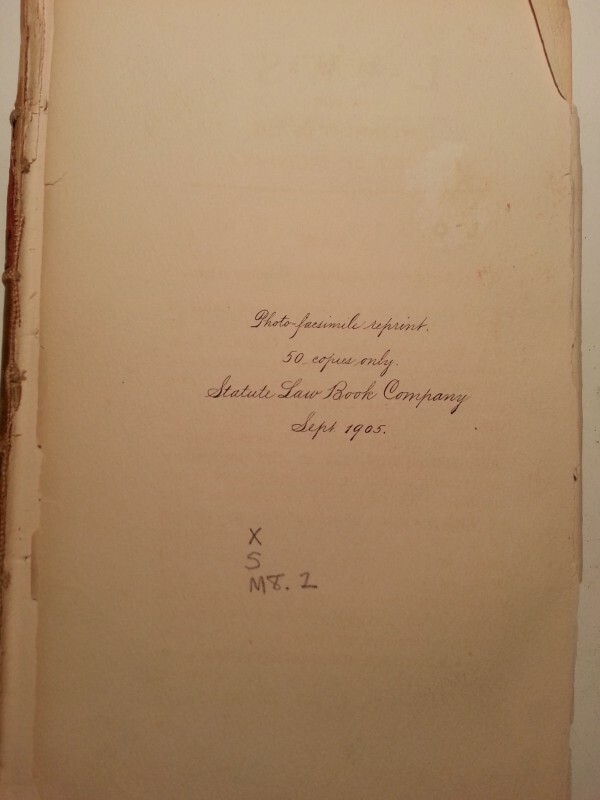 Other than the Hitler book, it’s been a while since I shared any pics of my conservation work. 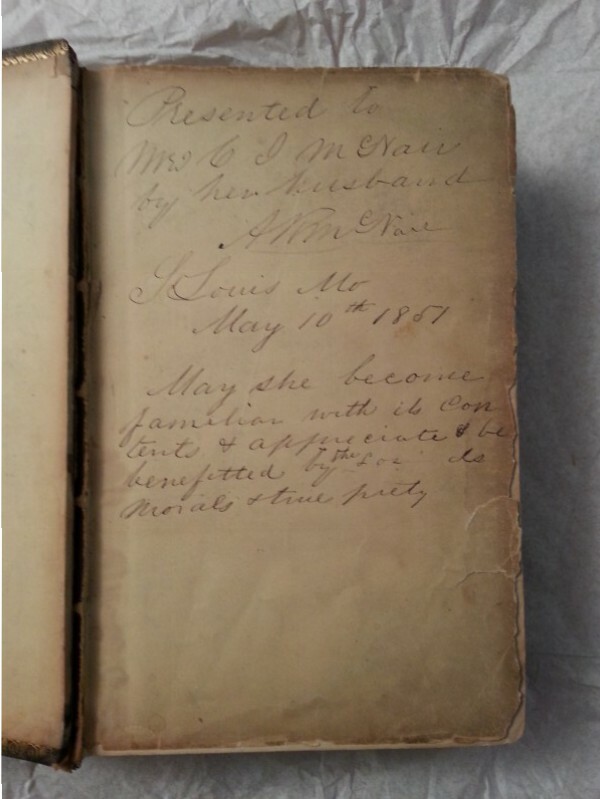 So, here’s something a little nicer: the family bible of Missouri’s first Governor, Alexander McNair. 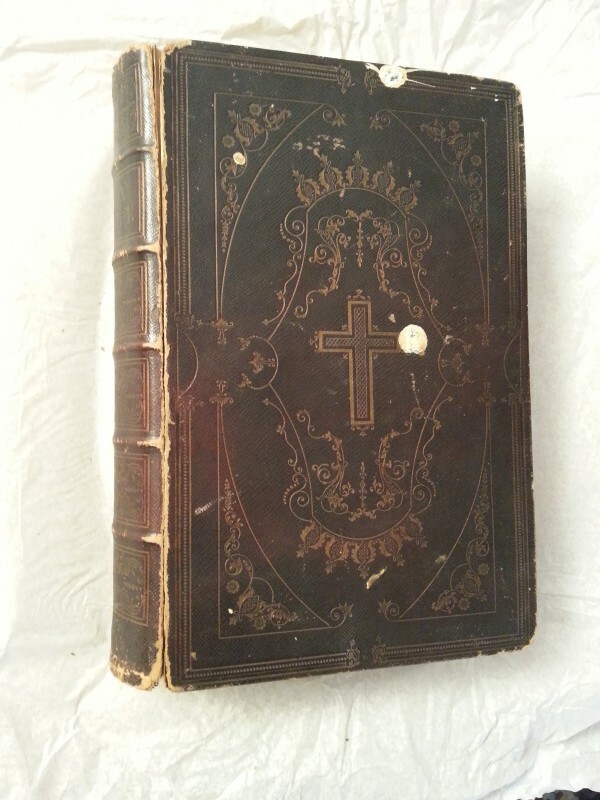 The date on the bible is 1848, and the inscription on the flyleaf is 1851. So this was evidently owned by Governor McNair’s children. This is actually a fairly common pattern you see across the US, where the first generation of settlers on the frontier don’t have these kinds of family artifacts — it’s their children who do. You can’t tell from the image, but the sewing structure was also broken, which meant that the whole book needed to be disassembled, repairs done as needed, and then resewn before remounting into the extant covers, saving the endpapers because they have inscriptions on them. Cover has been cleaned, redyed, and protective consolidation done on the edges and corners. There’s a new piece of leather (goatskin) providing a new structure to the spine. If you look closely, you’ll see that the spine is wider than it was originally – that’s because in resewing the book, due to the age of the paper, I had to do it in a way which gave it strength and support – but that meant more “swelling” of the spine. It’s a trade-off you have to make: either more fragile, or slightly bigger. Usually in conservation work the choice is for more strength. 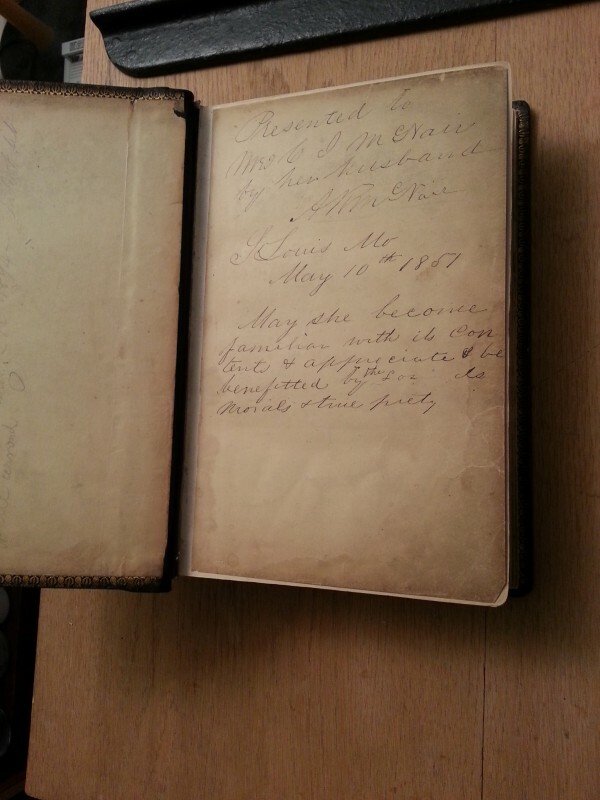 Here’s a pic of the inside front cover, showing an inscription on the fly-leaf. If you look closely you can also see a gap along the spine. That’s where the original hinge is broken, and the cover partially detached. This sort of inscription was common during that era, where a husband (or father) would give the book to his wife (or daughter) with wishes that she will study it and live according to it. If you look along the edges, you’ll see damage from handling. The flyleaf has been de-acidified, with kozo repairs to the tears along the edge of the page, and then trimmed slightly. Again, it’s hard to see, but there’s a new hinge and the cover has been securely mounted to the resewn text block. The original endpaper has been lifted up, and the new hinge has been inserted under it. This maintains the original appearance as much as possible, but gives the book a secure structure. And if you like, you can see it in person at the First Missouri State Capitol State Historic Site.